Where's the 'Where are my tags?' help box? I'm looking for the Where are my tabs? link in the below image. But it seems that I would've liked to see it again anyway. 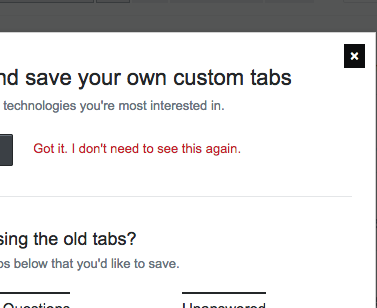 I was looking for a tab (the interesting tab - which, come to find out, is now home), and I wish that you had some sort of help button where I could access that diolog again, even though I clicked the Got it button. Why have the question descriptions and user info (avatar and badges) been removed for “tagged questions”?